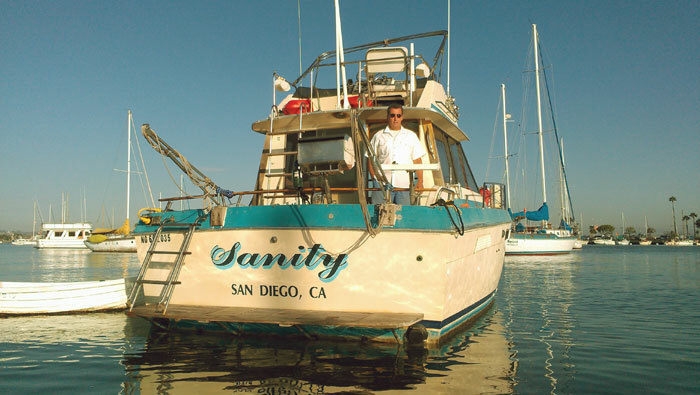 TWO HARBORS — Upon seeing the upcoming forecast and dealing with a week’s worth of high winds at Santa Catalina Island, Rick Stratton decided to cut his annual two-week vacation short and take his 33-foot Chris-Craft powerboat Sanity back to San Diego Bay. But before he could even pull the anchor, Stratton’s plans took a quick change of direction, as a series of events left him perilously close to losing his boat on the cliffs off Two Harbors, before being rescued by some visiting lifeguards. “It was really a matter of seconds and inches that saved my boat from disaster,” Stratton said. The day of Aug. 14 started how the rest of the week had gone for Stratton, with winds howling and his boat anchored near the Two Harbors campsites along the Isthmus Cove’s east end. With no relief from the wind in sight, Stratton decided to leave his summer vacation spot early, head over to Avalon for generator repair, and then head home to his mooring in San Diego Bay. “I had two anchors out, and I needed some help to get them pulled, so I had some guys who were on a 16-foot Boston Whaler come over and help me,” Stratton said. As he boarded his dinghy and pulled the bow anchor, Stratton was expecting the assisting boat to be close enough to keep his boat from drifting toward the cliffs. But the winds came up so quickly, they pushed it right up against the cliffs before the two men could assist, Stratton said. The craft was now perilously close to the cliffs, and Stratton had no way of maneuvering the boat out of danger. He immediately got on the radio and sent out a mayday, hoping for the best. But as he continued to work to loosen the stern anchor, help arrived in an unexpected form, as a Seal Beach Lifeguard vessel responded to Stratton’s mayday call. Rescue boat operators Mark Lees and Mike Sesenko were running junior lifeguard training exercises for their annual Catalina trip when the call was made. “They came in, tossed me a line — which I immediately cleated — and pulled me away from the rocks,” Stratton said. After getting the boat a bit away from the rocks, Stratton was able to get the secondary anchor lifted, which was full of seaweed and kelp. By then, a second lifeguard boat and the Two Harbors Harbor Patrol vessel had arrived on the scene, and a diver was called in to cut off the kelp so Stratton could get the anchor on board. “I was just so thankful they were there, and so ecstatic they saved my boat: There was not but a second or two to spare before my boat would have been destroyed,” Stratton said. “We were on that spot, and we were able to help, which we were happy to do,” said Seal Beach Lifeguard Capt. Joe Bailey. After getting the boat out of harm’s way and onto one of Two Harbors’ moorings, Stratton called Vessel Assist to help unwrap his stern line from his props and assess any damage done to the boat’s hull. “It was pretty well wrapped, and he was just so ecstatic that his boat was saved — and so thankful to the lifeguards that helped him out,” said Vessel Assist skipper Chase Henderson. Henderson got the line unwrapped and followed Stratton for a few miles on his way to Avalon, to ensure that the boat was in working order.